Easter afternoon we were driving over to a cookout at James’s cousin’s house. 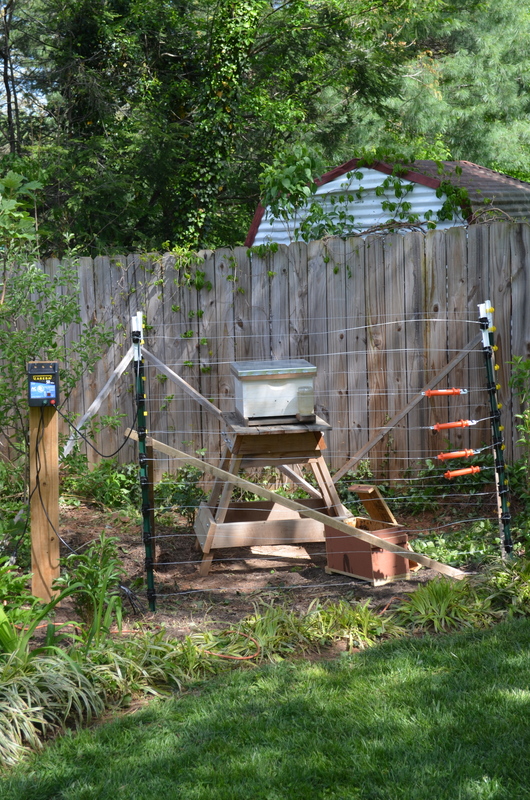 Right around the corner from our house, I saw a person in a beekeeping suit in our neighbor’s yard. 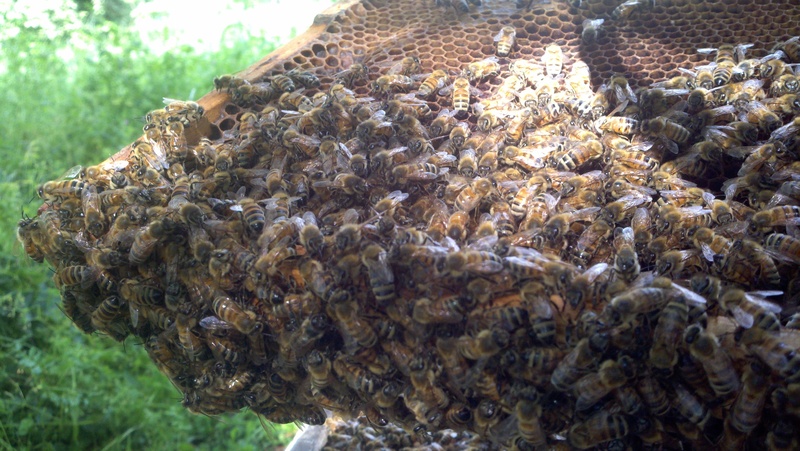 Well, I figured there must be a swarm so we pulled over to check it out. 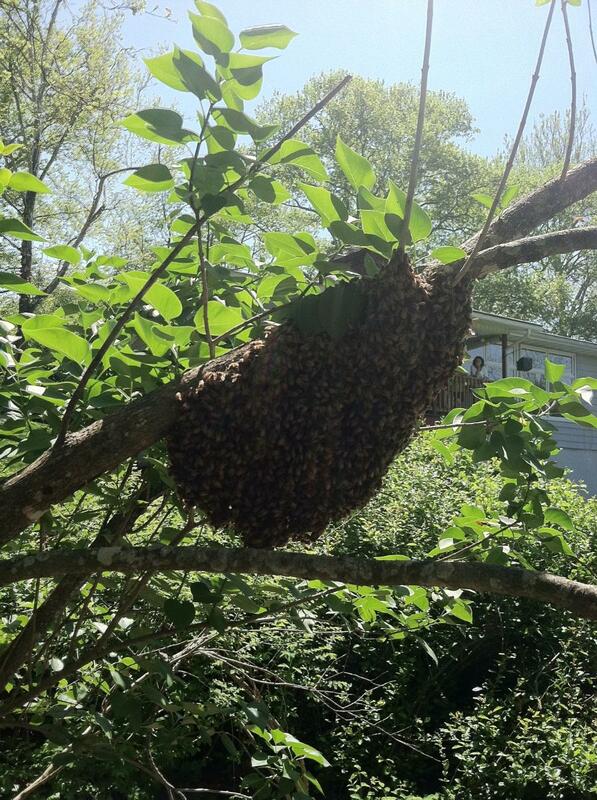 Sure enough, our neighbors had a swarm in their backyard. 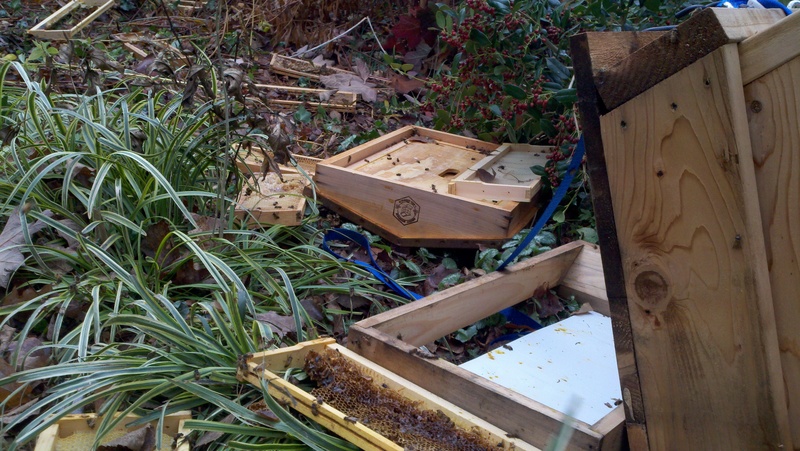 We told Andy, the beekeeper, that we had an empty bee box in our yard and were on a wait-list for getting bees this spring. 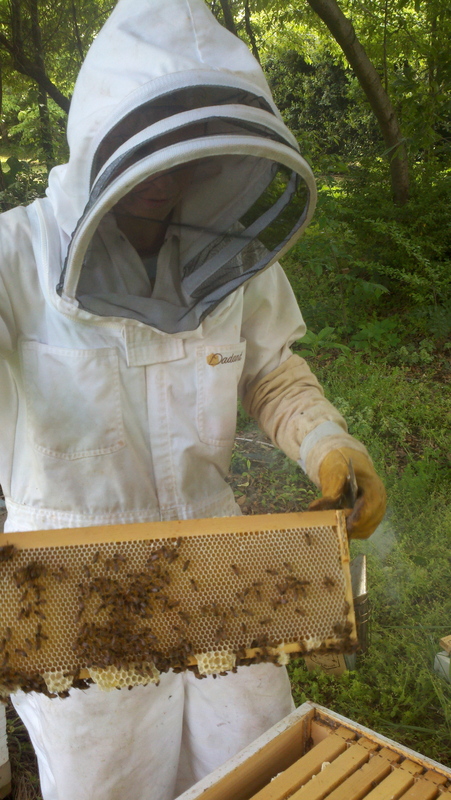 He told us he’d captured 3 swarms in the past week, so he was all set on hives, and he offered to give us these bees. Woohoo! 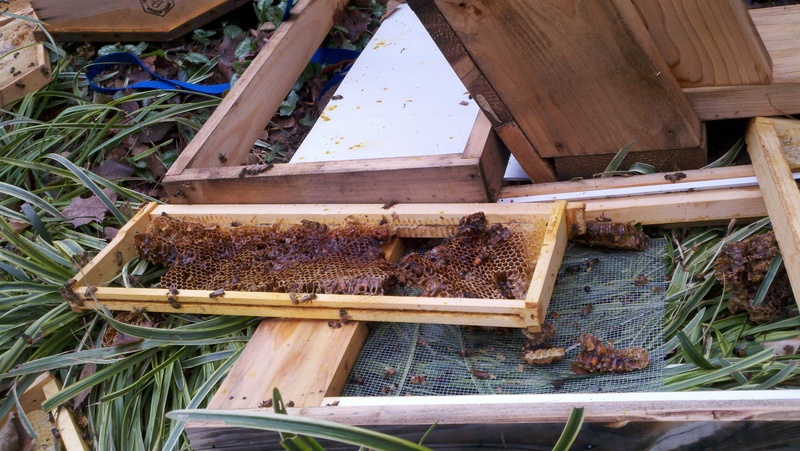 He got them all corralled into his bee box, stapled some screen over the entrance, put them in the back of his pickup and followed us back around the corner to our house. 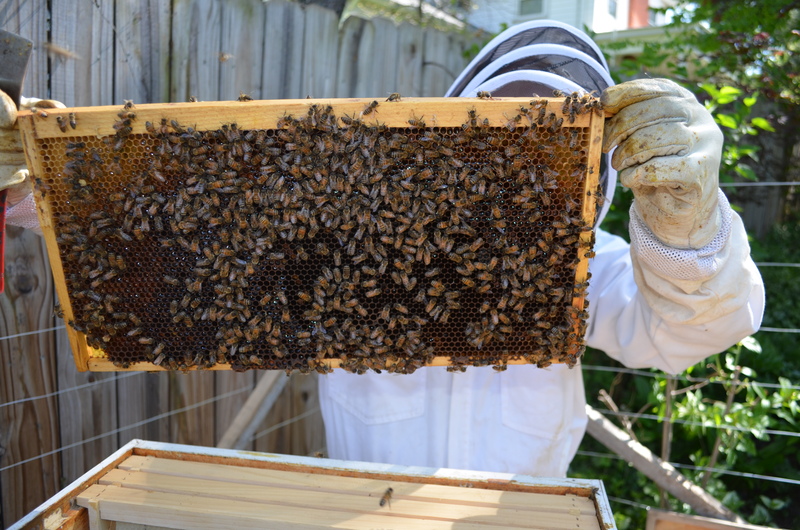 He told us what we needed to do to get them transferred over to our bee boxes — I was listening intently, but not understanding much, with the notion in my brain that I’d call my brother ASAP to get him to come over and show me what to do with them later. 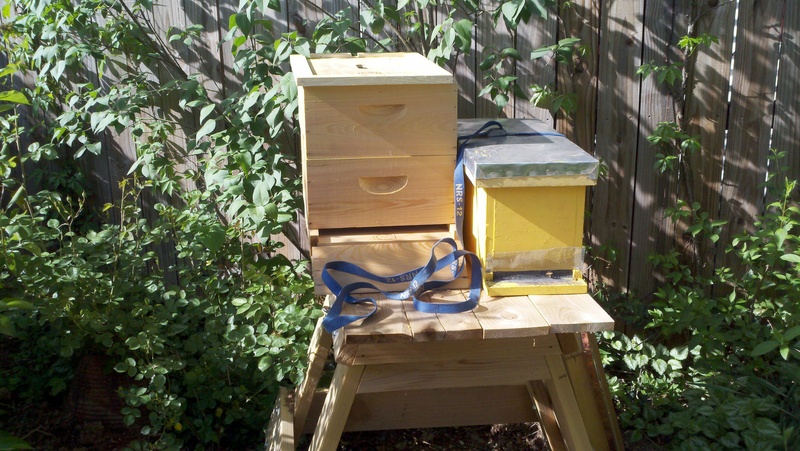 Well, later came around, Craig got over here and we donned bee suits and transferred the racks from Andy’s box to ours. 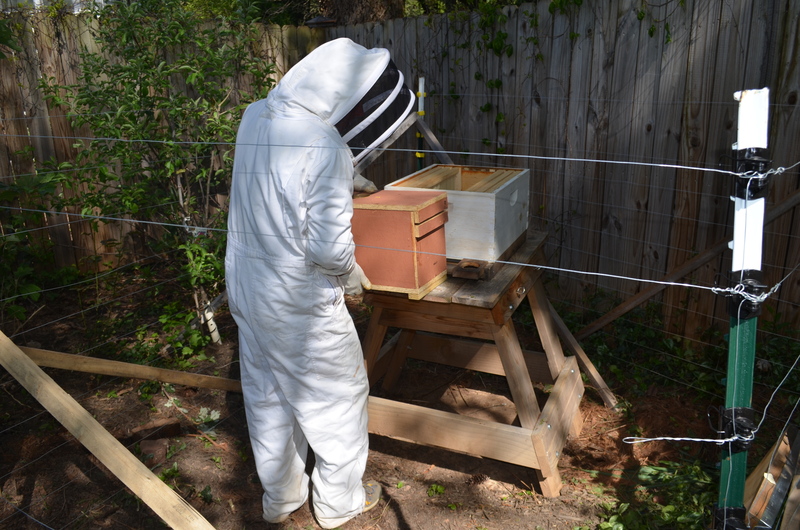 I was a little nervous as that was the first time I’d worked with bees since my one or two feeble teenaged attempts when my dad started tending a few hives in our backyard (I’m sure I was more scared of other teens seeing me in a bee suit than I was of the bees). Anyway, it was amazing. They were pretty calm but their collective buzz was steady and loud. I felt safe in the bee suit even though they were flying all around us. 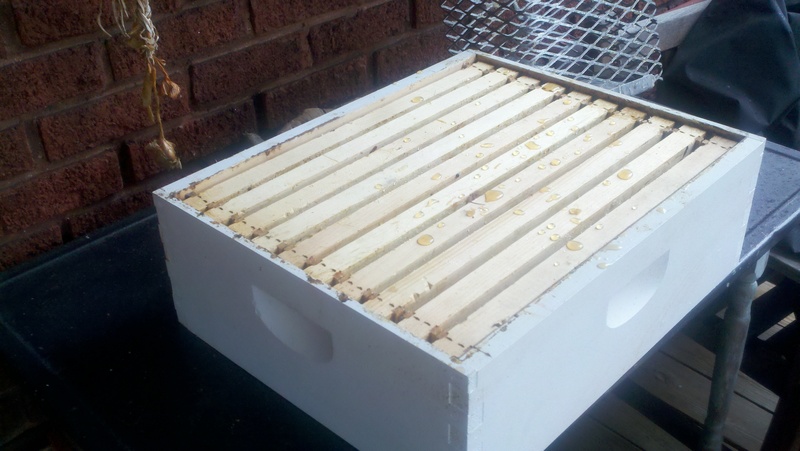 We got them all transferred, added a sugar water feeder to the front of the box to help feed them till they get established (in bee-speak, I think that means they’ve got to build their wax honeycomb cells up enough to be ready for them to put honey into…I think). 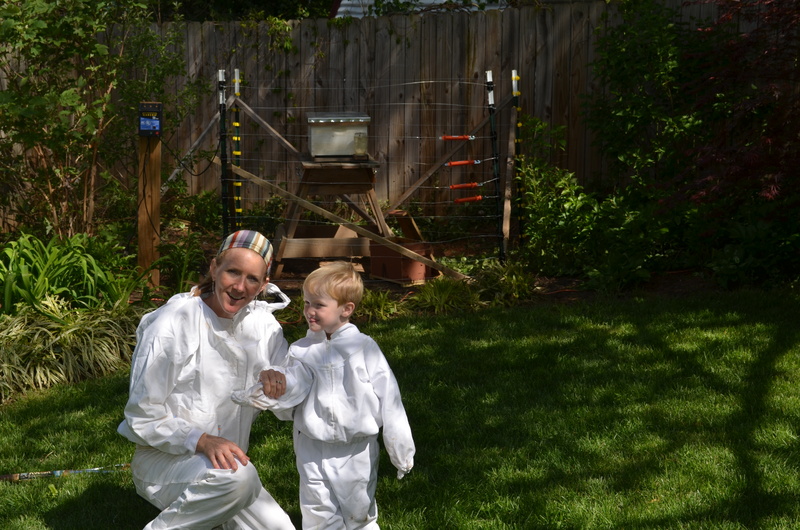 Of course, the boys were totally taken with the entire process — especially the bee suits. How cool to be able to look like a spaceman/alien and it doesn’t even have to be Halloween! 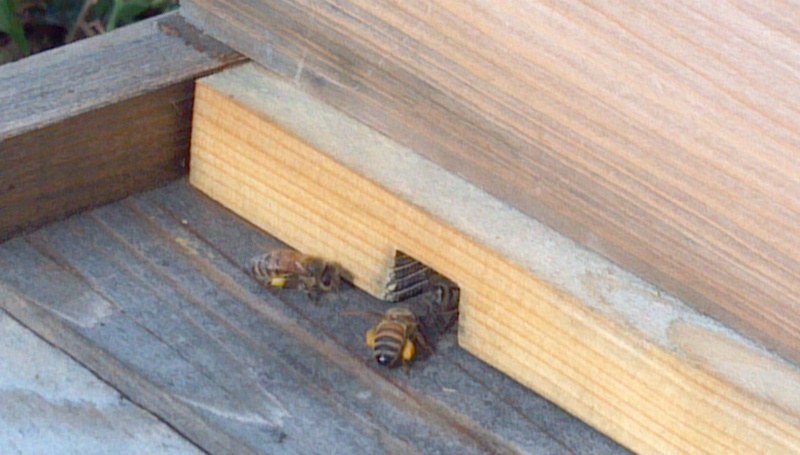 They didn’t get too close to the hive but were watching what we were doing. They’re only 4 and 2. I wonder if it was instinct helping them keep a safe distance, or if they were following James’s lead (who didn’t have a suit but was also trying to watch from a couple yards away). The next day, my brother and I had to go to Greenville for family business(not exciting stuff). 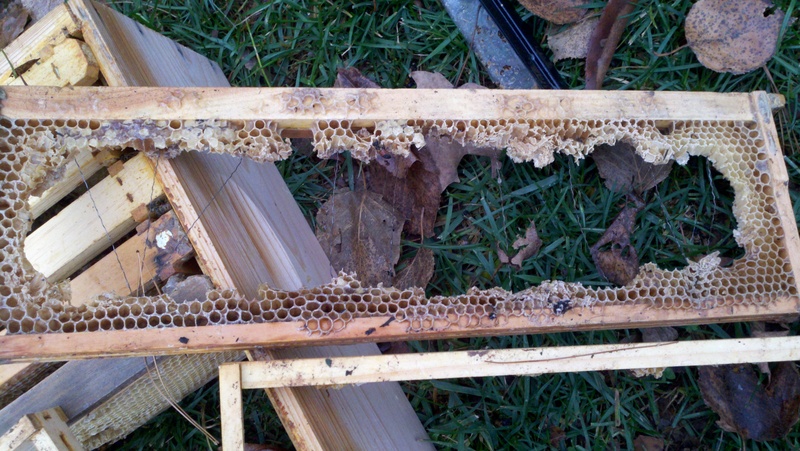 We went to my Dad’s house while we were there to check on his four hives. 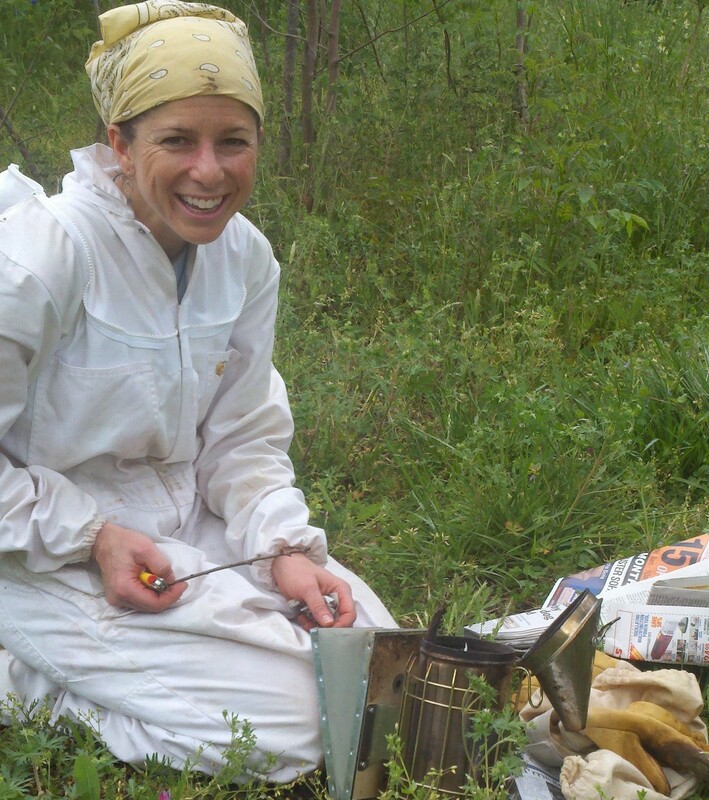 When we got there, our friend Amanda was already there, suited up and checking the first hive. 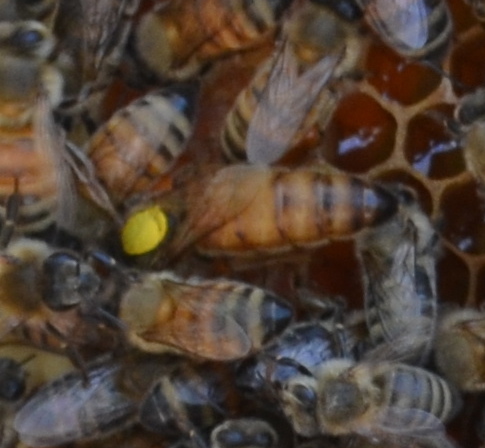 You also look for the queen — my favorite part of the entire activity. 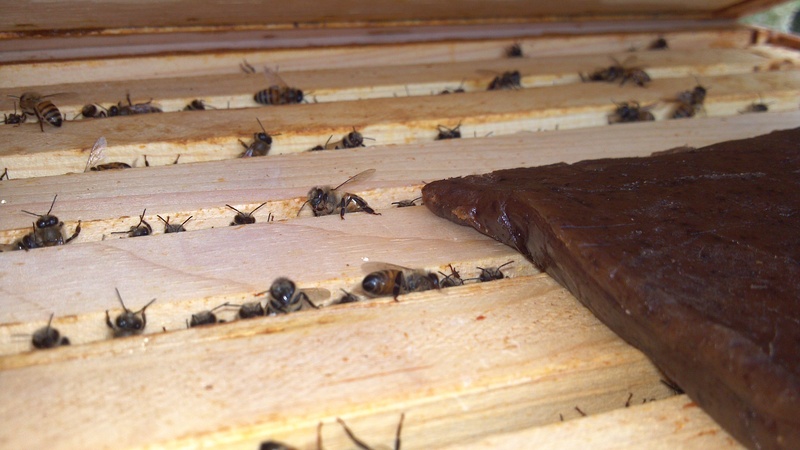 I’d always envisioned the queen as just kind of sitting still in one place, immobile, while the drones and worker bees helped move her around so she could lay eggs in the cells. 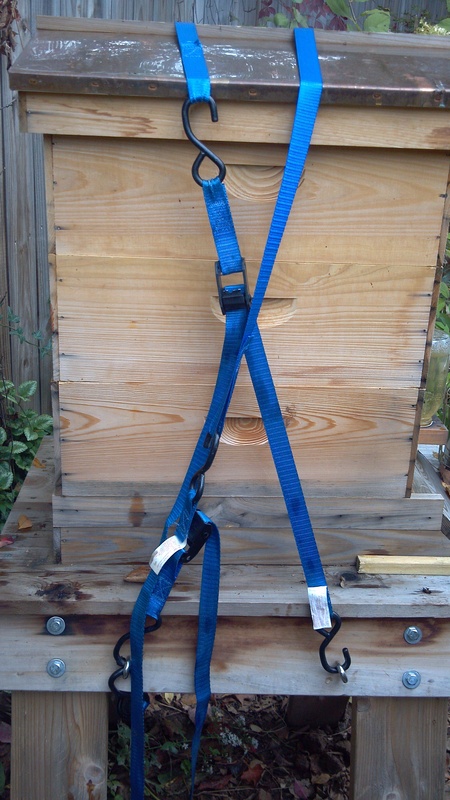 Nope, the queen of the hive I first looked in was just as mobile and busy as all the other bees, moving around fairly nimbly for having a much longer abdomen than the others. 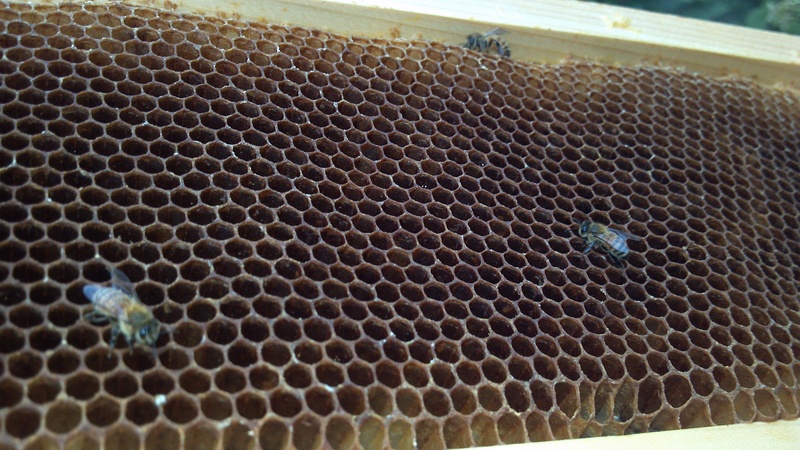 We saw the queens in the other hives too and they have been working hard, making healthy bees and hives. 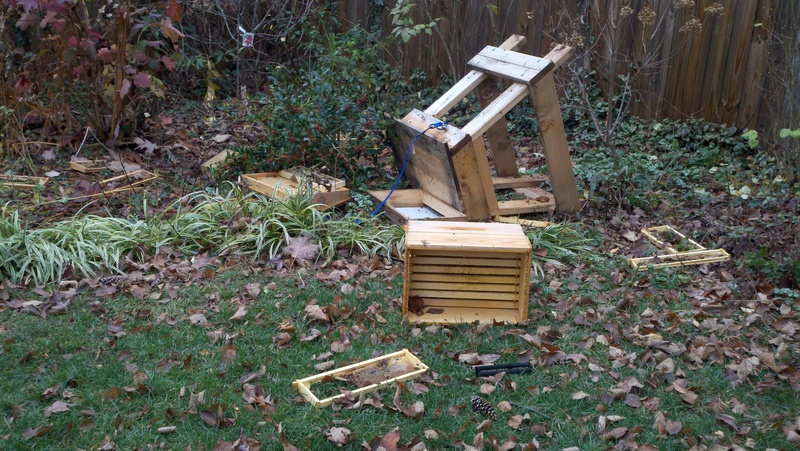 Learning by doing, baptism by fire — whatever this crash course in beekeeping was, it sure was fun. I did get stung once through my glove but it wasn’t too bad. I guess I was distracted by all the activity. 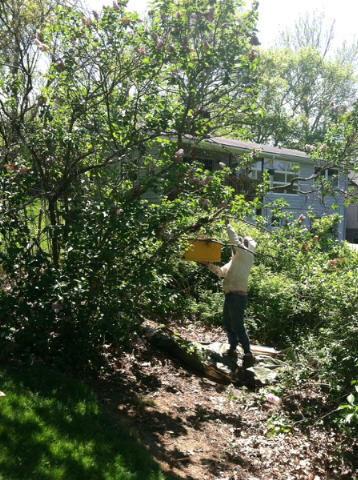 Here I am trying to figure out how to get the smoker to work, loading it up with sticks I’d carefully picked up from among a ridiculous amount of poison ivy in my dad’s yard. It is a true miracle I didn’t end up with a major PI problem. 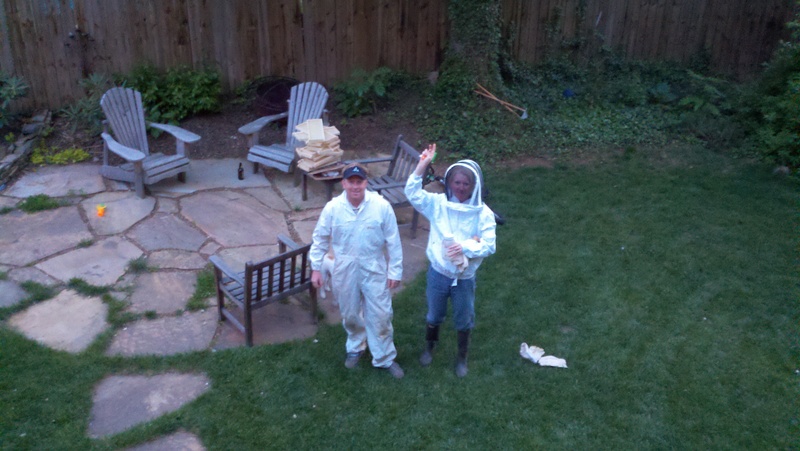 Thank goodness for the full coverage of the bee suit! 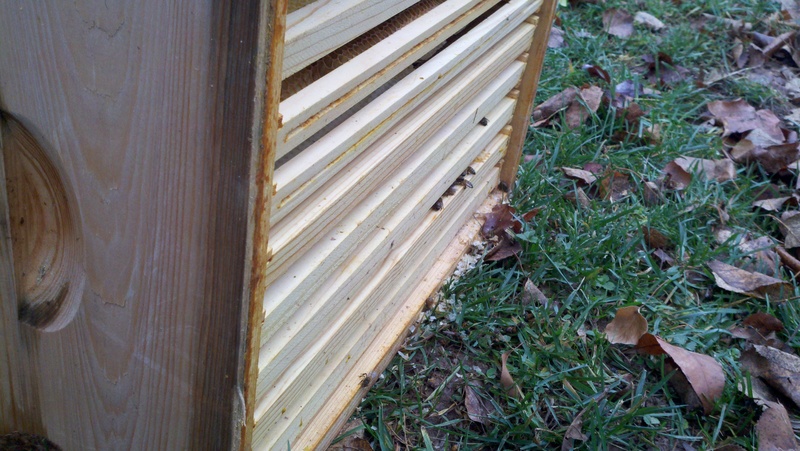 Amanda explained to me that the smoke confuses the bees by masking the pheromones they emit when they get mad (i.e., when people get in their hive), so they stay calmer. Back in Asheville the past couple of days, I’ve been intrigued by these new residents in our backyard. 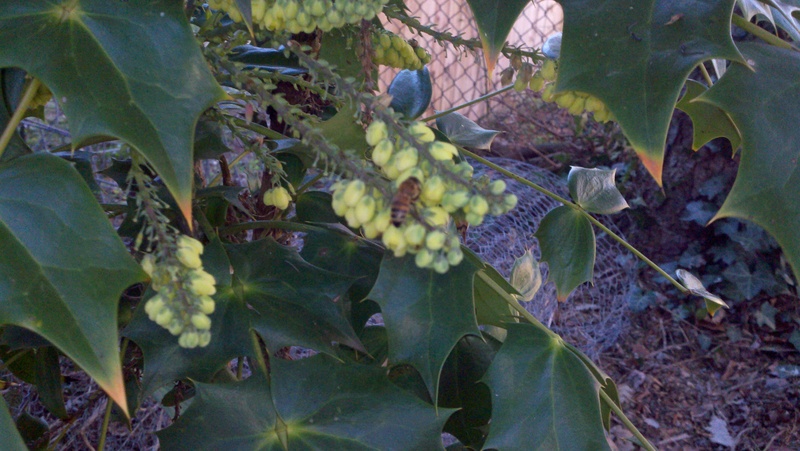 I can see the hive from our porch. There’s a lot of activity right outside the entrance, but Craig assures me they’re not getting ready to swarm and leave. He says they’ve got to get their bearings, and he’s confident they like their new home. This afternoon I told my 4 year old that we needed to go to the store. 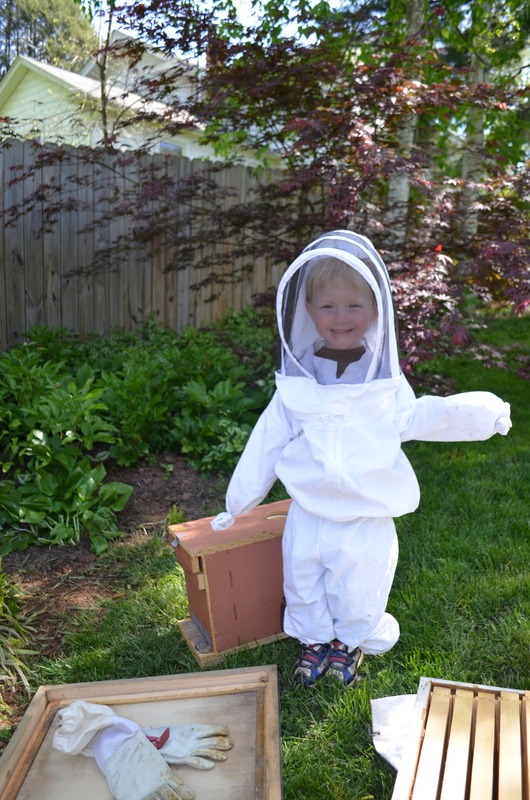 He asked, “Are we going there to get my bee suit?” I looked online and sure enough there’s a place that sells bee suits for kids. I think it’s great, but I know it will start World War III if my 2 year old doesn’t get one too (they don’t make them small enough for him)…he’ll just have to wait a little longer….and enjoy the honey in the meantime! One thing about taking pictures for my blog is that my camera phone gets a little dirty. I’m writing about gardening and composting, so when I take photos to put in a post, my hands have usually been in the dirt or I’ve been wrangling a muddy toddler. 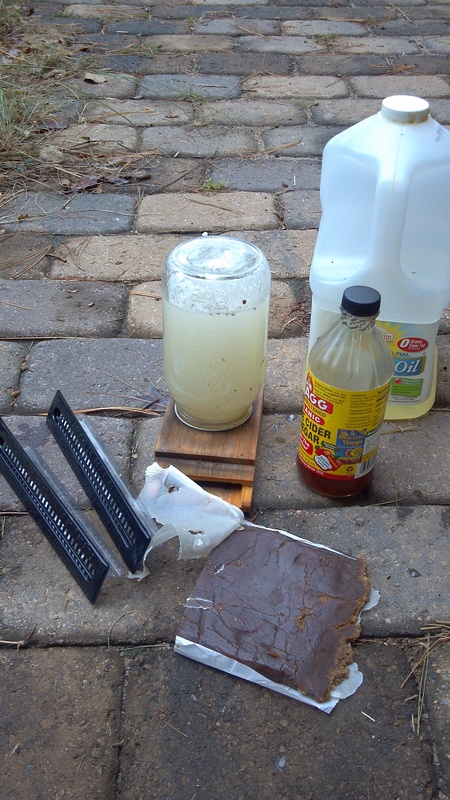 Consequently, my phone got pretty sticky as I was trying to capture some images of the whole process. 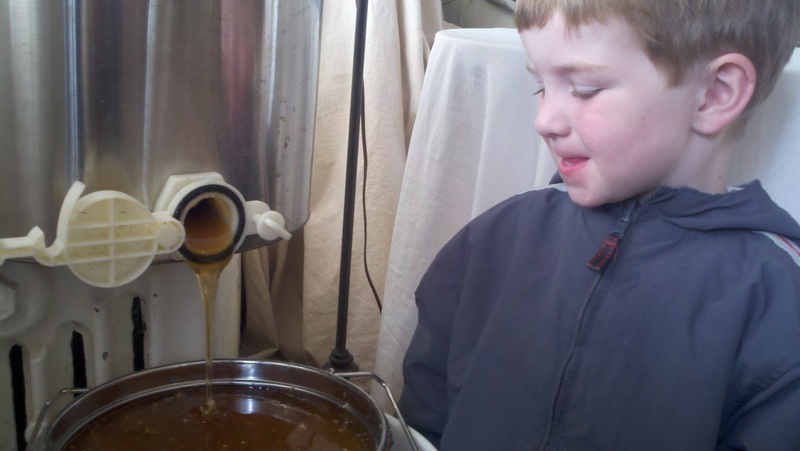 And the honey can be found in various places in our house, from the front porch to my 4 year old’s forehead. **Note — the above tool is a hot. knife. My thumb will attest to that. A burn/cut combo. Ow. It was a scary enough tool that even my boys wouldn’t get near it, and they’re usually attracted to anything electric, sharp, and/or poisonous. 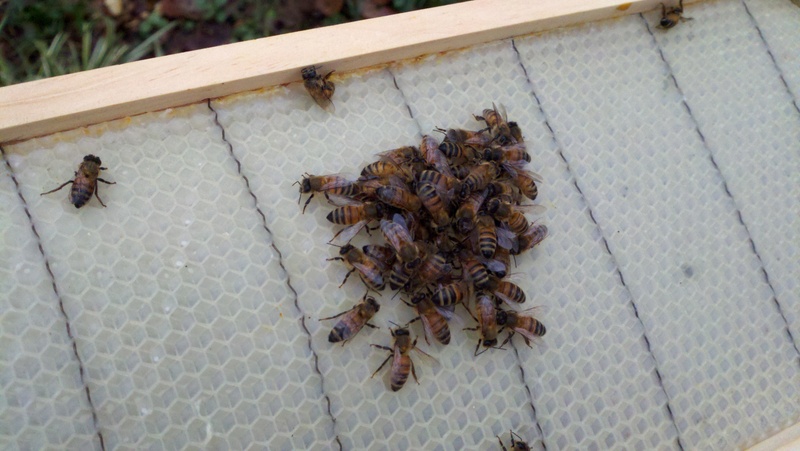 Two uncapped racks went into the extractor at a time. I turned the handle and it spun the racks (they were in a cage-like contraption inside). 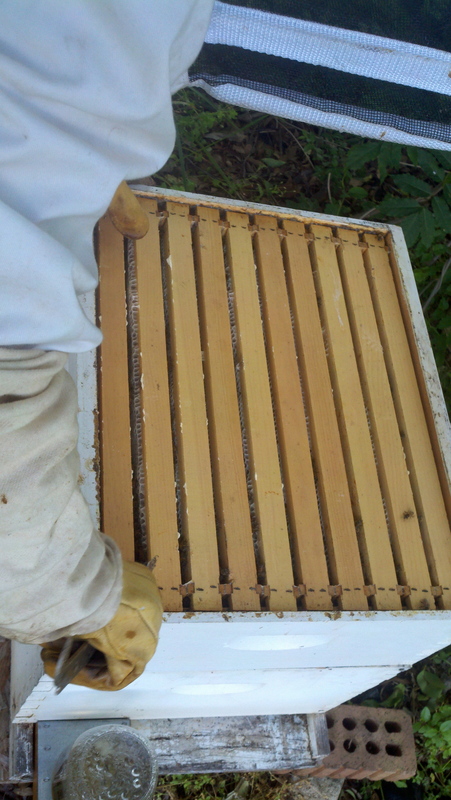 It took about 10-15 minutes of spinning per set to get the honey out. 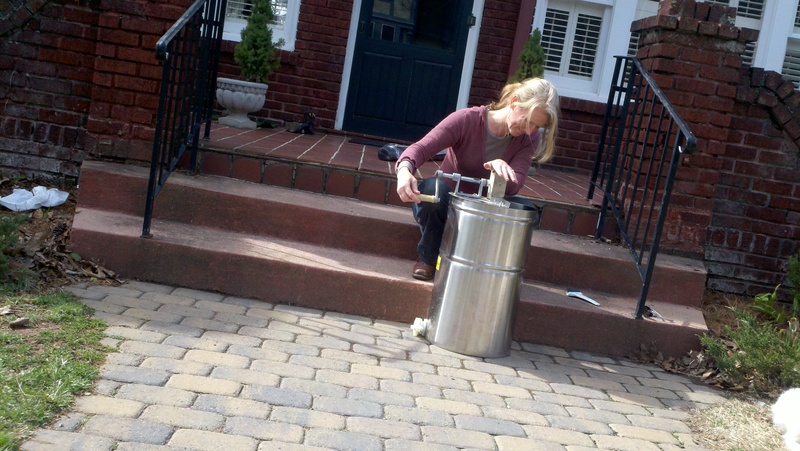 When I had the extractor on the front porch, my neighbor’s landscaper, Shylock, came over to check it out. 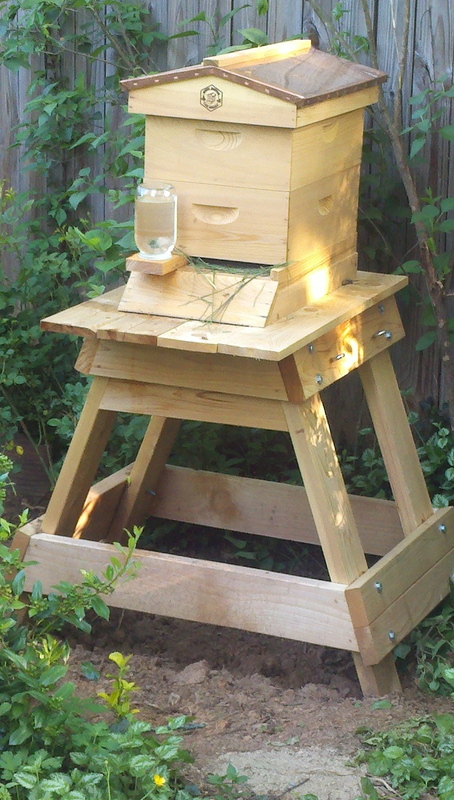 Shylock is from Zimbabwe, and he told me how he and his brothers get honey from hives in the woods there. 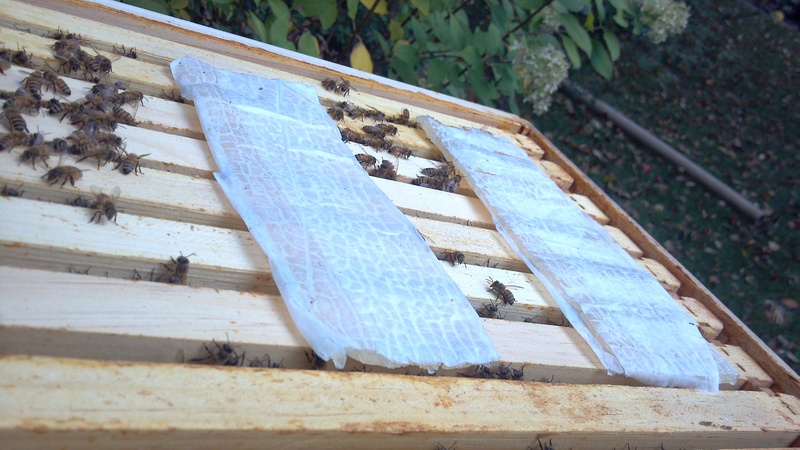 Getting honey from a wild hive is a whole ‘nother ball of wax (couldn’t resist)….I like the idea of bee boxes and protective bee suits myself, but it was truly fascinating to hear him tell about it. When they were all done, I brought the extractor inside to sit on the radiator. 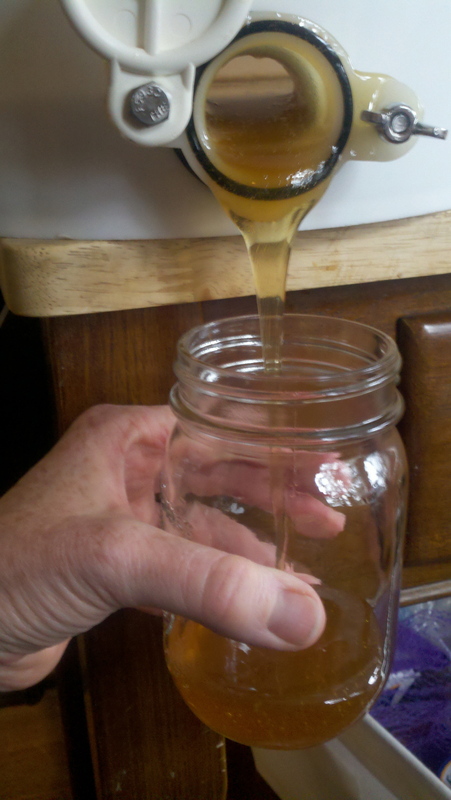 The warmth of the radiator made the honey less viscous so it flowed better when it was time to strain it. 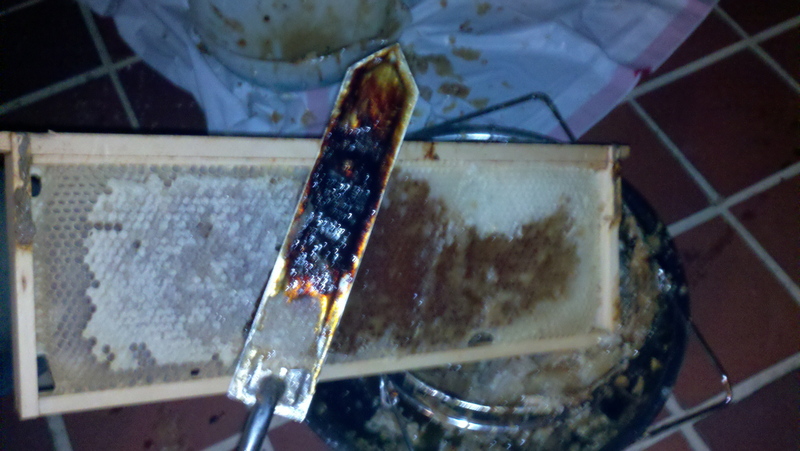 It also made our house smell deliciously of honey. 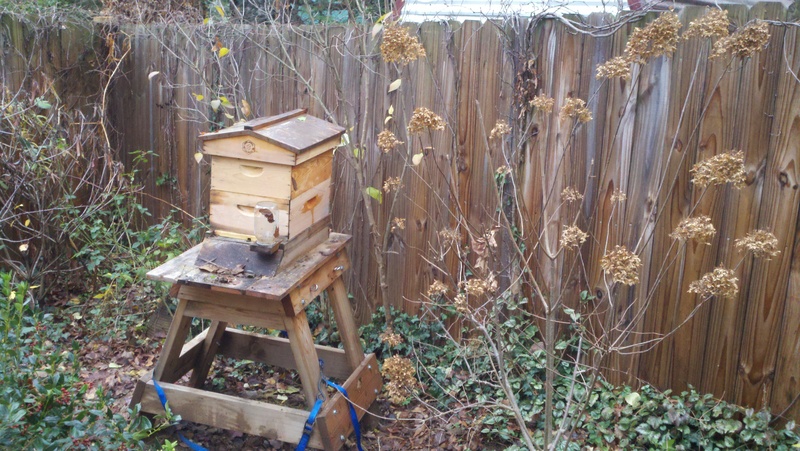 Our resident Pooh bear was right by my side once the honey started flowing: He eats a peanut butter and honey sandwich *every* day for lunch. He’d love to be able to live on honey alone. 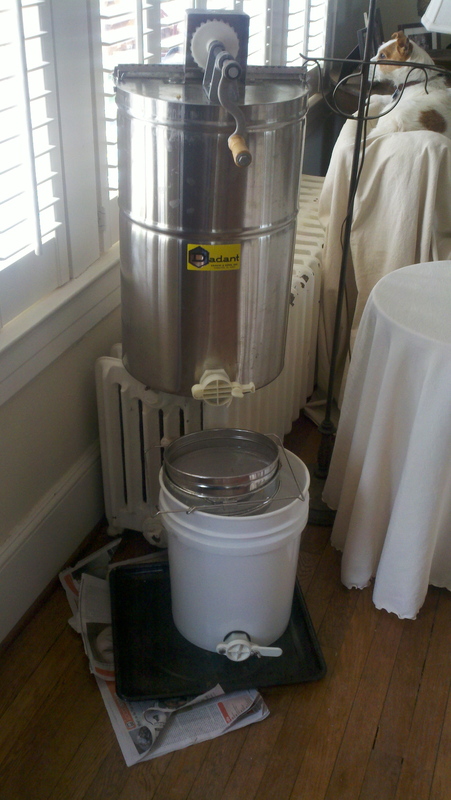 After all the honey went through the strainer and into the 5-gallon bucket, then it was time to put it into jars. My brother’s amazing sense of timing brought him back to the house right when I was starting this part — or as he described it, “the fun part”. Knowing that I have a touch of adult ADD and am a little klutzy (both amplified when toddlers are around) he kindly reminded me that it was *really* important to keep an eye on the honey filling the jar — not fun when it overflows. Its flavor is just perfect…it is flowery and light. I have been eating straight spoonfuls of it and can’t stop. 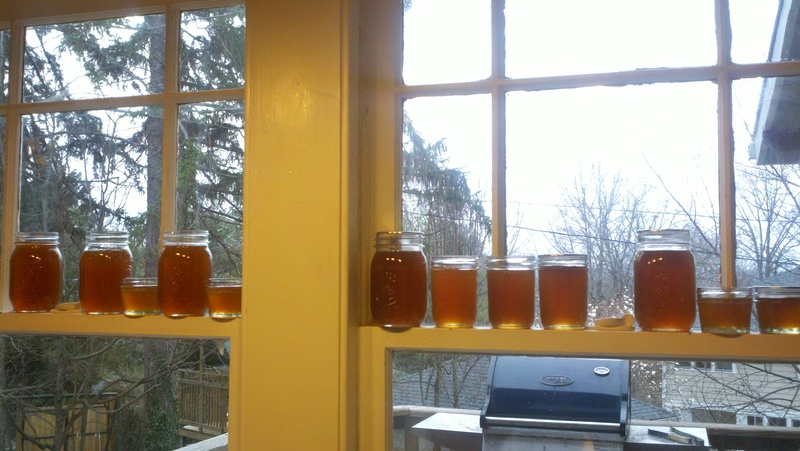 I used random left-over jars so there were 3 different sizes, but we ended up with 10 pints, 3 half-pints, and 4 4-oz. jars. 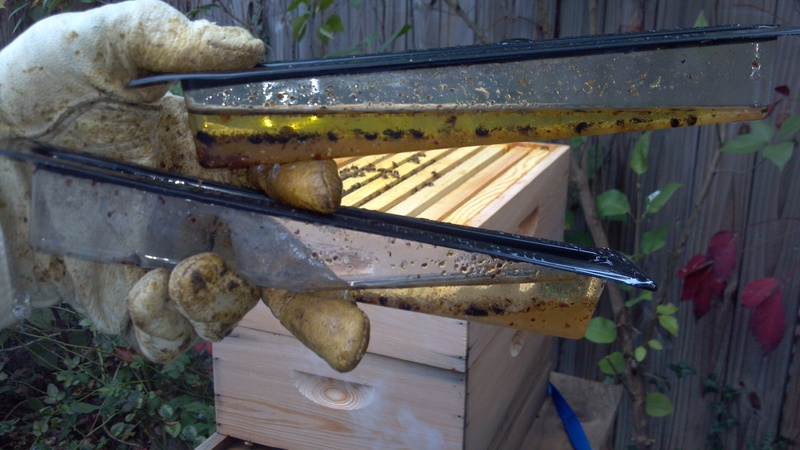 If my math is correct that’s over a gallon of honey…. 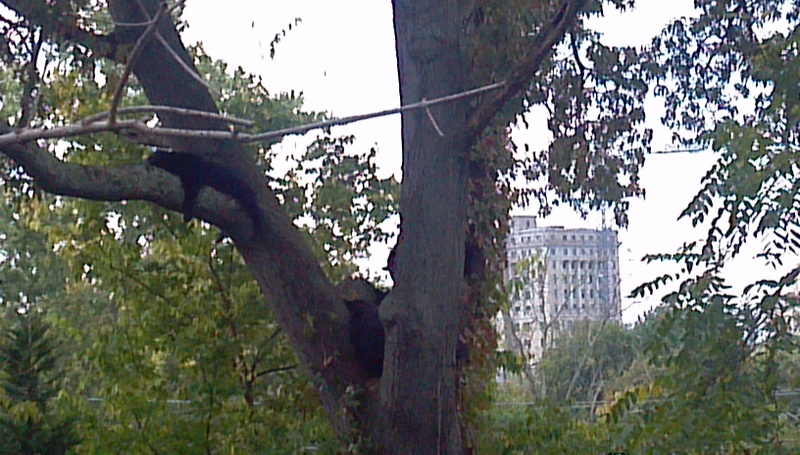 And one very happy resident Pooh bear.